It's surprising what a difference those little touches can make to the final look of a room. So having got your made to measure curtains in place, there are a number of accessories that I can make to go with them. Below are just some of examples. 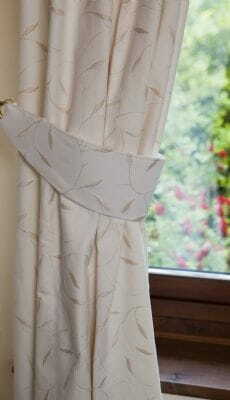 Tie-backs are a great way to hold curtains clear of the window to enable as much light in the room as possible. I would particularly recommend tie-backs if the material you have chosen is a heavy bulky fabric. There are a variety of different types of tie-backs. They can be shaped, the lower edge could be scalloped or I could add braiding for extra decoration. If you let me know what you would like and I will see what I can do! Valances are used to cover the top of curtains. They can be used simply to fill the void at the top of a window and give a neat finish to curtains by hiding track of headings. They usually consist of pleats or gathers attached to a rod or track above the window and give a soft effect. They can be particularly effective if you have large windows. Pelmets are another way of covering the top of curtains. They are more solid than valances, and consist of a piece of wood covered in padding and fabric. The depth of a pelmet depends on the size of the curtains so if you give me the measurements of the curtains you want a pelmet for I can calculate it from this.